This photo I took a few years ago holding my camera in one hand praying I got the right angle. I have no make up on to cover up the acne scars or tired eyes. I wanted this picture to tell my truth. 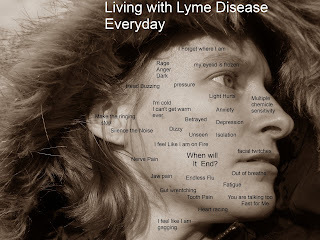 I never thought I would be using to tell my Lyme Disease journey in such a powerful way. Please feel free to share it around. It really says in few words so much of what I have dealt with while in treatment over the past 5 years. It tells a truth that words cannot express. I asked my son to draw what he thought Lyme Disease looked like out of curiosity. This is what he drew. I was floored. He understood way more than I gave him credit for. No child should have to deal with a sick parent. And I hope I keep getting better from here so he can have a fully operational mom. I am so lucky to have a beautiful boy.